For non-emergency contact, please call us at 541-967-3950. We answer the phone 24×7. Communication is a priority at the Linn County Sheriff’s Office. It is important that communication is a two-way street between the Sheriff and the residents of Linn County. 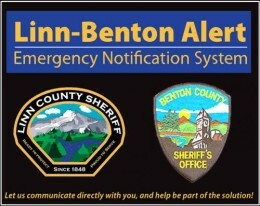 Our new out-call notification system, Linn-Benton ALERT, allows us to contact you, should we need to make a public service announcement to all county residents or those in designated areas. We want to make sure that you feel comfortable in contacting us at any time to pay a compliment, ask a question, or make a suggestion. If you have an emergency, please call 9-1-1. While the Linn County Sheriff's Office doesn't take the report of criminal incidents online, we are happy to take a bit of information from you, and have a Deputy Sheriff contact you for follow-up. Please provide a brief account of why you would like to speak with a deputy. Once your request is received, a deputy will contact you within two business days. If you need to file a report sooner, please call 541-967-3950. Before sending us an email, please consult our CHL Frequently Asked Questions page for answers about Linn County Sheriff's Office Concealed Handgun Licenses, and our process. If you still don't find the answer you are looking for, please email us using this form.